The British Consulate in Yaounde, Cameroon will issue you a visa for the UK if you are taking your wife back to the UK or a fiancee visa if you are taking your girlfriend back to Britain. If you have lost your passport the British Embassy or British High Commission in Yaounde will issue you a new one if you apply for a British passport in Cameroon. 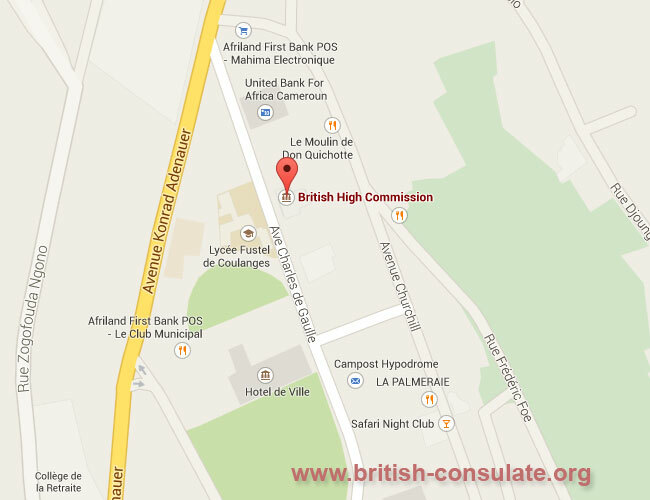 The contact details for the British Embassy in Cameroon is listed below. There is also a street address and map to show you the location of the embassy. If you are getting scam or 419 letters then the email address below being the embassy email address is where you need to send inquiries too. The following are the public holidays for Cameroon. These are not from the British Embassy in Yaounde and you would need to email them for more information as to other holidays on which they may be closed. There are also some movable holidays which vary each year and these are set normally the year before as public holidays. Again, call the embassy in Cameroon first before deciding to go there in person. The following holidays are public holidays in Cameroon however the dates on which each public holiday occurs varies, according to its corresponding calendar, and hence there is no set date. These are the time taken to process and issue a British visa in Cameroon. You will note that the dates vary from 1 month to 3 months. These would depend on the documents handed in so ensure that you have all the correct documents and that everything that was requested had been attached. Email the British Embassy in Cameroon for more information.